The MPP has been rather ambitious since the last update in which I shared photos of some of our more interesting unit profiles. The recording of those profiles was essentially the final task that had to be completed before backfilling those units. Once accomplished, we opened five new units at locations scattered throughout the western plaza: three more to test possible structure walls and two to help tease apart the complexities of the magnetic signals revealed within the large “circular anomaly.” A fair amount has happened in the last three weeks, but I’ll bring you up to speed on some of it in this post. Of the three units placed over possible structure walls, one exposed a straight-walled pit of unknown function and two exposed wall sections of burned wattle-and-daub buildings. These latter features appeared as dark gray (magnetic high) anomalies. The magnetic signals of two burned buildings in Moundville’s plaza, the locations of our 1-x-2 meter units represented in orange. The image on the left shows a lone structure in the west-central plaza, while the image on the right shows a cluster of structures in the southwestern plaza. The burning afforded a startling degree of preservation – we recovered intact pine posts and sizable sections of the split-cane mats once fastened to them. 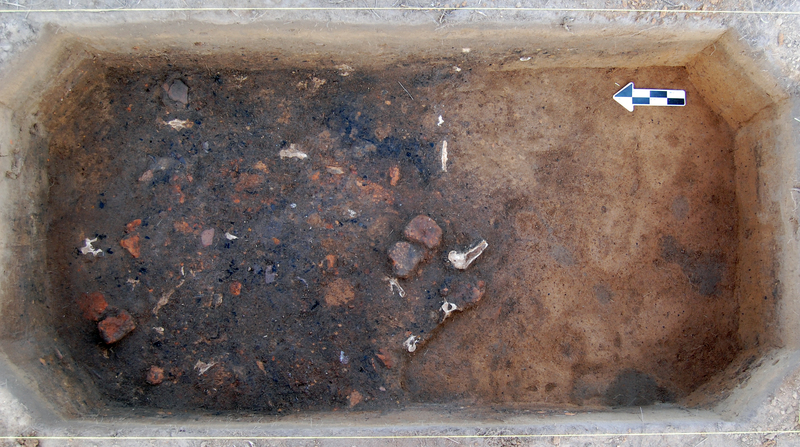 A thin but artifact-rich midden (trash heap) was found overlying the architectural remains in one of the units. It yielded several large pottery sherds, including enough pieces from one serving dish to just about fully reconstruct it. Designs on these pieces of pottery suggest that the burning of this structure dates to the latter part of Moundville’s history long after the town’s defensive palisade had fallen into ruin. We did not expect this high degree of preservation. 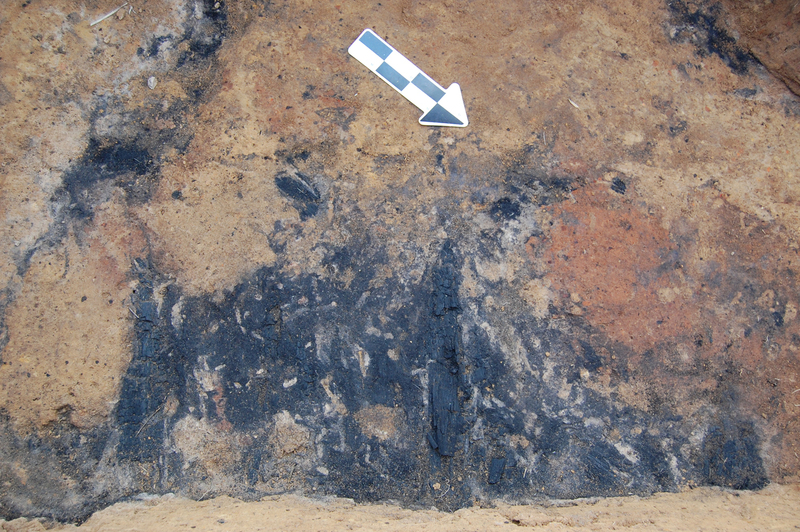 Most archaeological work in the southeastern United States consists of tracing the soil stains that represent where posts and other architectural features once stood. In this unit, we found the posts themselves. 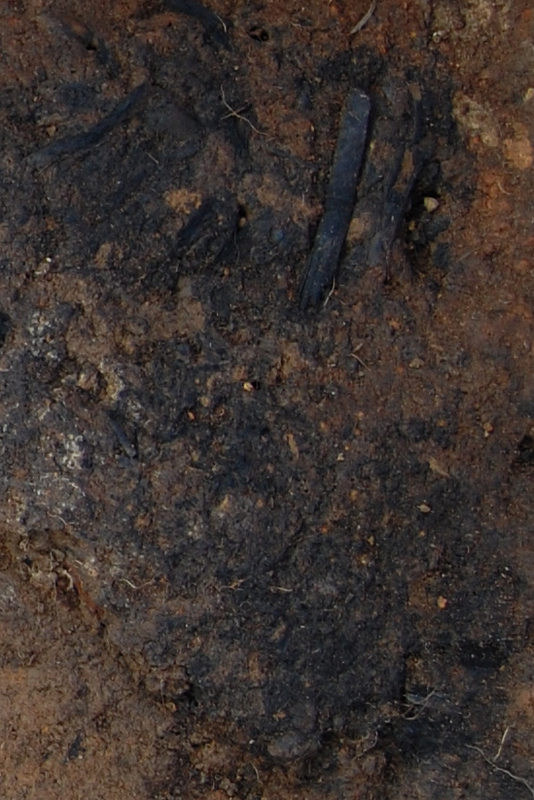 Notice the evenly spaced charred poles within the charcoal concentration (slightly enhanced here for easier viewing). The pile of reddish orange material in the lower left corner is what remains of an ancient hearth smashed in antiquity. A closer view of the burned posts. The Mississippians split cane shoots into strips that were then easily woven into mats. They lashed these to the upright posts of their homes. Here is what’s left of one such mat. The trash heap overlying the daub and cane matting was chock-full of food remains (deer bone), pottery, and fired clay. The project is nearing its end. Tomorrow is the last official day, but we’ll be in the field for a couple of days next week to finish up the odd jobs that remain. I’ll have a couple more updates for you all before it’s over! Beware the bunkhouse! We store some of our gear in this old park building which doubles as a refuge for mice and, usually, nonvenomous snakes. While straightening things up last week, I disturbed a young copperhead nestled within a pile of plastic bags. Peter Corn scooped the snake into a flat shovel and tossed it into the nearby borrow pit. He was quick, but I managed to snap a few shots!